As a result of the violent collapse of socialist Yugoslavia in the 1990s, the majority of Western Balkans states went through atrocious and disastrous wars that set back the region, both economically and politically. In the aftermath of the wars, the European Union offered its membership perspective to Yugoslav successor states and Albania, emphasizing the need for and importance of reconciliation, stability, democracy and economic prosperity in the region through European integration, as this would naturally improve the overall security in Europe. While the EU’s geopolitical interest in the Western Balkans is rather obvious, states with less obvious strategic interests have also become more visible in the region, notably Turkey and Russia. However, some scholars argue that this ironically enough may be due to the slowdown of the EU’s eastern enlargement. The question is whether the slow enlargement process in fact could inordinately affect the political and security situation in Europe? Although the EU integration process has come to a standstill in some states, particularly in Bosnia-Herzegovina and Macedonia, the EU remains highly committed to its agenda. The standstill has, among other things, become a result of the EU’s heightened concern of other issues, such as the 2014 Crimean crisis and war in Ukraine, which means that enlargement has not been a primary topic in EU circles for a long time. However, in February 2018, the European Commission finally presented its new strategy for the Western Balkans. The strategy states that two countries from the region, Serbia and Montenegro, could potentially be ready to join the EU by 2025, while at the same time making it clear to politicians in all six countries – Albania, Bosnia-Herzegovina, Kosovo, Macedonia, Montenegro and Serbia – that they will have to undertake the range of democratic changes needed to join the Union. Whether these states will join the EU is still uncertain, and the road towards membership is still long and bumpy, but one thing is certain: the EU must not give up on these prospective members – otherwise it might lose its place to other powers. The prospect of peace and stability in Europe could in that case be extremely vulnerable. According to the Hungarian Minister of Foreign Affairs Péter Szijjártó, the EU would also need to speed up the integration process in the case of Serbia and Montenegro in order to not lose those two states, allowing them to join already in 2022. It is difficult to imagine that either Turkey or Russia could replace or offer an alternative to EU membership, and even though relations with the EU stand at a historical low, Ankara has made it explicitly clear that there is no alternative for EU integration of the Western Balkans and that its presence through soft power is not in competition, but complementary to EU rapprochement. It is nevertheless important to remember that both countries have historical and cultural legacies in the Western Balkans, and that Turkey today does not link itself exclusively to the majority Muslim communities in Albania, Kosovo and Bosnia-Herzegovina. But are its initiatives in the region even remotely enough to replace the EU in case accession talks fail? Apart from securing and stabilizing the region, the aim of Turkey’s foreign policy towards the Western Balkans has been to establish and strengthen economic and cultural ties. In economic terms, Turkey is already an important factor for the region at large. Ankara has especially since the boom of the Turkish economy in the 2000s increasingly been developing trade relations with the Western Balkans, and the region remains a secondary partner for the Turkish economy. While its primary trade partners in the region are Albania, Kosovo and Bosnia-Herzegovina, Turkey has also been improving its economic ties with Serbia lately. In October 2017, the presidents of Serbia and Turkey, Aleksandar Vučić and Recep Tayyip Erdoğan, signed an agreement to boost trade by establishing a cooperation council, as well as several other agreements aimed at improving economic relations – an apparent bid to expand influence in a region frustrated by the slow pace of EU integration. According to Erdoğan, trade exchanges between Serbia and Turkey should target $5 billion by the end of 2017. This is, however, relatively small compared to the trade exchanges between Serbia and the EU, which in 2017 amounted to $38.93 billion. But more important is the cultural aspect of Turkey’s influence in the region, which could be more persuasive and appealing in case the EU chooses to postpone membership even further, especially in Bosnia, Albania and Kosovo, where the legacy of Ottoman rule profoundly marked the society and some of its most prominent features – for instance Islam as its religious heritage. In Albania, Turkey has also been investing through major economic projects, among them the creation of a national airline and the erection of the Western Balkans’ biggest mosque in the capital Tirana. However, due to the fact that these countries are geographically separated from Turkey, it would make it difficult to connect in every aspect, especially since they are encircled almost entirely by EU member states. While Turkey is trying to build its influence among majority Muslim communities in the Western Balkans, Russia is using its own leverage over Orthodox Christians, especially in Serbia and Republika Srpska – the Serbian entity in Bosnia-Herzegovina. The illegal annexation of Crimea, the direct interventions in Ukraine and Syria, as well as the scandals of the United States presidential campaign, have overshadowed Russia’s power play in the Western Balkans. But although it has generally been less noticeable and far less severe than other emphatic moves by Moscow, it does not mean that it is any less important. Officials in Brussels are not wrong when they make it clear that status quo is unsustainable and that politicians in the Western Balkans need to amend the fulfillment of the responsibilities related to the integration process. However, the EU should also note that the new strategy could lead to another Ukrainian scenario in which support for European aspirations prompt a backlash from opponents of enlargement, instead of rallying European governments around the project. Russia is therefore perhaps trying to take advantage of the EU’s weak strategy. Russia has for years used Serbia as a foothold to establish a friendly pocket in Southeastern Europe, but by postponing EU accession, the EU could be making this task easier for Russia. Serbia is especially a major target of the Kremlin’s anti-Western activities in Europe, primarily due to the fact that these two Slavic and predominantly eastern Orthodox Christian states share deep cultural and historical ties. In October 2017, Serbia also received the first of six Mig-29 fighter jets, which were provided by Moscow at no charge. This nevertheless means that in order to maintain this Russian military equipment, Serbia needs to remain close to Moscow to receive spare parts. This is indeed a clever way of making Serbia depend on Russian support. Moscow’s sphere of interest increasingly includes the Serbian entity in Bosnia, where a Russian-Serbian Religious and Cultural Centre is set to start in the summer of 2018 – an idea that initially came from Russian Foreign Minister Sergey Lavrov. This way Russia could be establishing yet another foothold in the Western Balkans, which could develop rapidly considering the Bosnian Serbs’ anti-NATO and anti-EU demeanor. 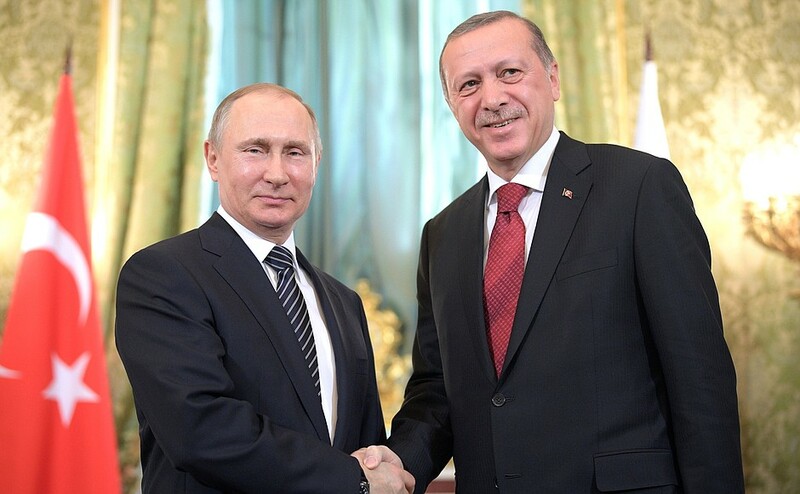 In the worst-case scenario, Russia and Turkey could coordinate their policies just as they have attempted to do in Syria. In case the EU does not open its eyes to these new geopolitical realities, its strategy for the Western Balkans will end in defeat.